The following comments about attractions in Seville have been posted from individuals. We believe that the best reviews of Seville, Spain are written by travellers and holiday makers who have experienced Seville first hand and want to share their thoughts. Can you share yours? 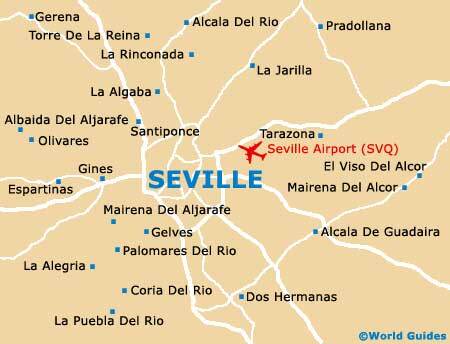 Please help us expand this section of our Seville World Guide. Let us know what you think about the attractions in Seville, Spain. Submit comments about Seville attractions here. The Royal Fortress of the Alcazar (Reales Alcázares) is where the royal family sometimes reside. This palace is on the Plaza del Triunfo and is actually a massive complex of different buildings and grand palaces. The architecture dates from various periods and some you can often spot all kinds of characteristics, like Rococo and Gothic and Renaissance, but it kind of all blends into each other rather seemlessly and successfully, like it was always meant to be that way. Inside there are lots of extremely detailed and beautiful tapestries, and outside the gardens are a bit of a triumph as well. You cannot come to Seville without doing the Alcazar, it has to be done - has to be! it is closed on Mondays, but open every other day. The Santa Cruz district is where the Jardines de Murillo is located, or as was called it, Murillo's Park. It is near to the Plaza de la Alianza and about 100 years old and was designed by the king, Alfonso XIII. The famous Sevillian painter of Murillo is buried here and there are a number of monuments here, including one to Columbus. It is part of the Alcazar Garden and is extremely beautiful and well thought out. I took some nice photos to show people when I got home, but we were lucky enough to actually see it in the flesh - much better! Please note that these Seville, Spain comments and reviews are posted by individuals and are not necessarily the views of World Guides.